1. Bottlenose Dolphins are mammals. Bottlenose dolphins nurse their calves with milk from mammary glands of the mothers. 2. Bottlenose Dolphins can swim up to 260 m. below the surface of the ocean. However they need quick access to air in the surface, therefore bottlenose dolphins usually are shallow divers and close to the surface. 3. Bottlenose Dolphins can stay up to 15 minutes under water. However bottlenose dolphins usually stay only a few minutes diving. 4. Bottlenose Dolphins use a technique called echolocation to find food and navigate. This technique is performed by sending ultrasounds through the water which is bounced back to the dolphin and then is detected by the dolphin in an organ called mellon which decodes the message very much like a sonar. 5. Bottlenose Dolphins are social beings. Bottlenose dolphins cooperate among each to get food. To do this, they work in teams to optimize the effort of hunting. They also cooperate for calf rising, when usually one dolphin helps the mother to take care of the calves, very much like a midwife. 6. The bottlenose dolphin can grow up to 2.8 meters. While there are some other smaller species, there are some species much bigger like the killer whale. 7 . Bottlenose Dolphins are warm-blooded. Their internal temperature is around 36 degrees. To keep this temperature they are surrounded by a thick layer of fat called “blubber” just below the skin. This fat, allow dolphins to resist cold temperatures and regulate their body temperature. 8 . 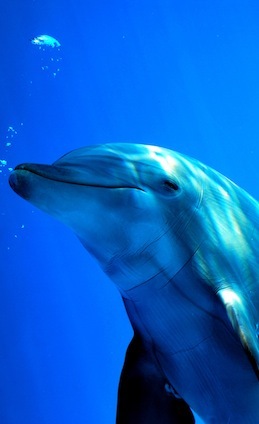 The average bottlenose dolphin brain weighs 1500-1600 grams. If this is compared with the average human brain which weighs between 1200-1300 grs. Bottlenose dolphin brain is larger, however this is not a conclusive evidence of dolphin intelligence as many other factors might be the cause of intelligence according to scientists, however this brain capacity is a clear indication that dolphins have at least the potential of higher intelligence. 9. Bottlenose Dolphins are great communicators. They can make a unique signature whistle that may help individual dolphins recognize each other or perform any other kind of communication still unknown. 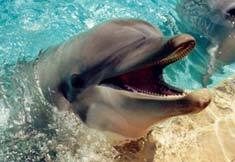 Dolphins even make noises so loud that can stunt fish. 10. Bottlenose dolphins can swim 5 to 12 kilometers per hour. Although they can reach up to 32 km/h.